After I shared my sketches from the Women’s March Saturday, some friends commented on how challenging it must have been to sketch while marching or while simply being in such an enormous crowd (latest counts put the number at close to 175,000 in Seattle). 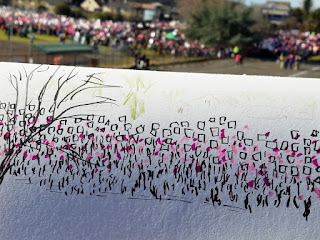 Although it was definitely the largest event I have ever attempted to sketch, I was surprised that it wasn’t as difficult as I had expected. I thought I’d share here the materials I prepared and tips I learned along the way. The first and most important rule for me was to keep my sketch materials simple. Although many sketchers at the event were able to make spectacular sketches in full watercolor, I knew I didn’t want to attempt it. I’d be on my feet and possibly moving the entire time, so my only goal was to capture the dynamic energy of the day – not with any accuracy, precision or even color. The crowd from afar is a mass of abstract marks. It was helpful that I knew ahead of time that the color theme of the event undoubtedly would be pink. So I picked out a couple of shades of pink in colored pencils and Zig brush markers, and I also brought a trusty non-hairy brush pen containing waterproof ink. 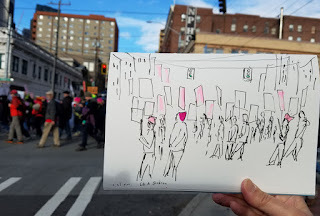 I did all my quick gestural sketches of the crowds with the black brush pen, then gave them small splashes of pink. I got bumped occasionally, but the view hardly changed. I brought my usual sketchbook signature, which is 6-by-9 inches and contains 140-pound Canson XL watercolor paper. When I fold back the side of the book I’m not using, it’s very stable for sketching, even held with one hand, and the page size gives me enough space to capture crowds. 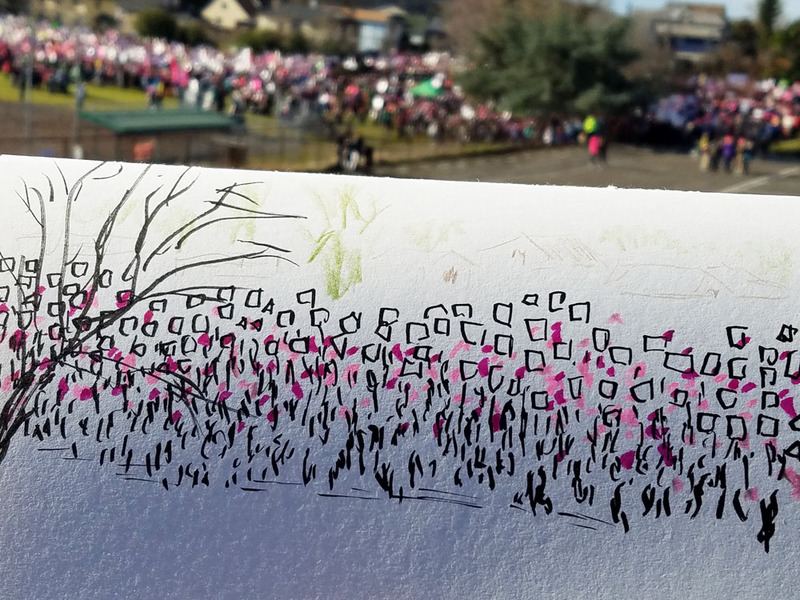 When I first arrived at the park where the opening rally was held, I had approached from the top of a hill looking down on the crowd. At that distance, everything is abstract and relatively easy to capture with nothing more than lines and marks. Marching (the way slugs march) in the street, we were all moving at the same pace and in the same direction, so I simply kept moving with the crowd. The view didn’t change much directly in front of me, so that was the easiest sketch to capture, even though I got bumped occasionally. 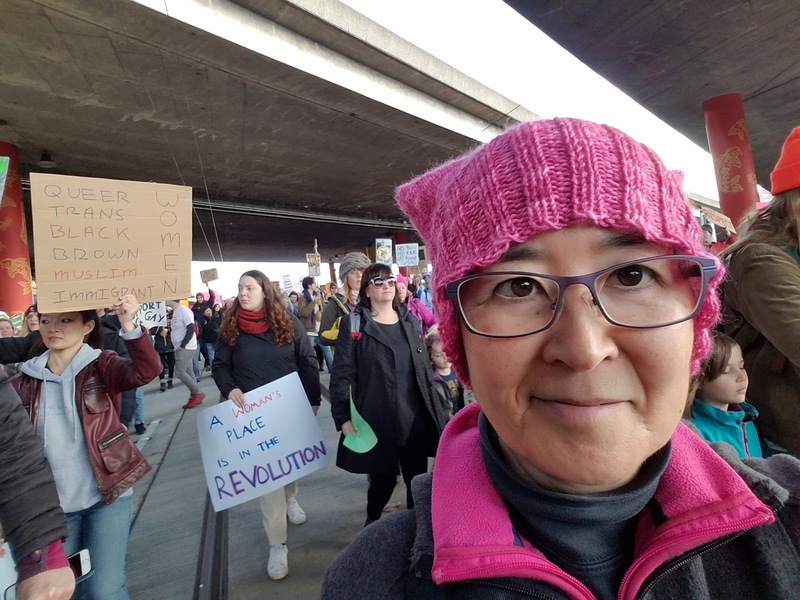 At one point during the march, I swam out of the stream and onto the sidewalk. Turning to face the crowd at a right angle, I got a different view of the participants flowing by. This time it was both easier and harder: Easier because I wasn’t being jostled by other marchers, but more difficult because the view changed every second. Still, I kept in mind that it was about capturing the group and the energy – not individuals – so I stayed loose and open to the changing scene. I stepped out to sketch from the sidelines. One part of my prep turned out to be unnecessary. For days before the march, the weather report had predicted rain. I was determined to participate, regardless of weather, but I still wanted to sketch. How could I prepare? 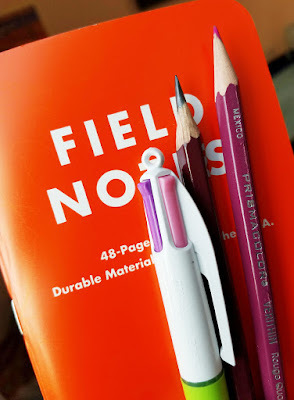 I knew that Field Notes’ Expedition notebook is made of that strange synthetic paper called Yupo, so the pages and covers are completely waterproof. I also knew that many types of inks can’t be used on Yupo because they won’t be absorbed, so they would smear or wash off the surface. Internet research indicated that the best results would come from ballpoint pen and graphite pencil. My own tests confirmed both – I could easily write with ballpoint and pencil on the page and then spray with water afterwards, or I could spray the page first and write afterwards. In both cases, the pen and pencil worked fine. My rain kit: maybe next time. But what about color? Finding colored pencils that worked turned out to be a challenge – my favorite soft pencils seemed to slide off the Expedition paper’s slick, completely toothless surface. Then I read on the blog Pencil Revolution that Prismacolor Verithin colored pencils do surprisingly well on Yupo pages – and author Johnny Gamber was right! 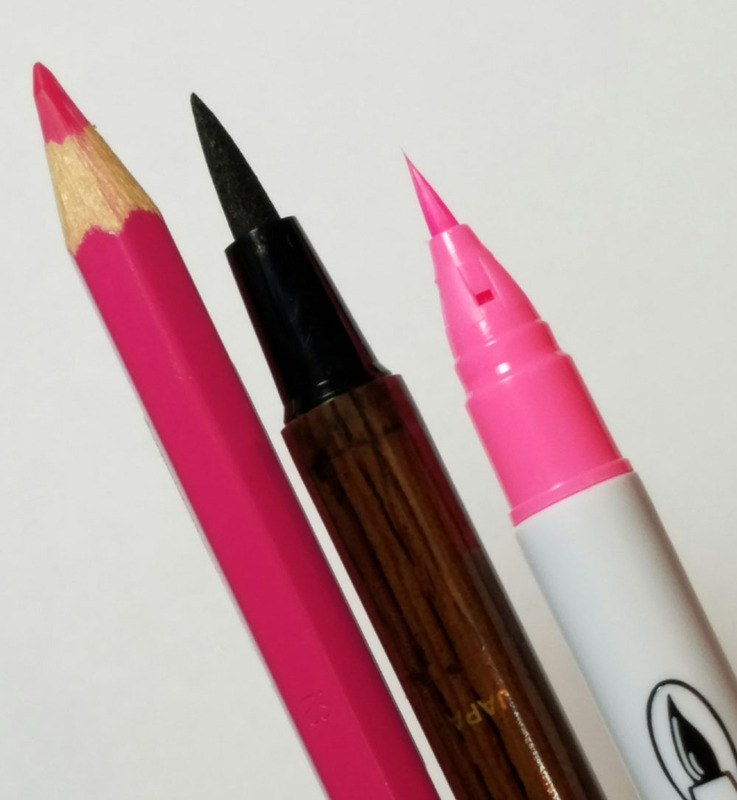 Although I have a small selection of Verithin pencils, I ordinarily don’t like them at all – they are intended for precise detailing and outlining and are therefore too firm for the way I like to use colored pencils. But the hardness is apparently exactly what’s needed on Yupo paper, because I got the best colored pencil results with them. Great to hear your thought process about what to take. I did the same thing and brought along a spiral notebook that fit into my purse, 3 pencils in various shades of pink, and a preppy pen. I think my problem was that I also had a poster. If I had ditched that I probably would have been better off. It didn't help that I was with 3 other people and didn't want to get separated from them. I will have to think about "sketching in a moving crowd" so I'm better prepared next time...if there is a next time. 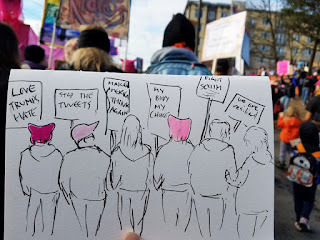 Holding a sign would definitely have hindered my sketching! I decided that my statement would come afterwards -- in the form of the sketches. Excellent report about your process! Frances reminded me of another paper option for rain: Write in the Rain notebooks.. a local company, too. But she said she could only use ball point pen in them. Looser = Faster = Fresher?